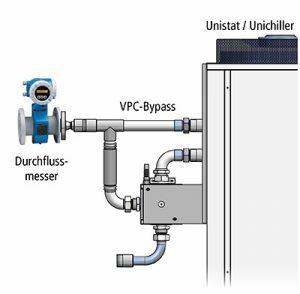 Huber offers a variety of measuring equipment for installation in the temperature control circuit in order to measure and control the flow rate. The flow rate can be displayed directly on the controller and can be requested and/or set through the digital interfaces (USB, RS232, LAN and optionally RS485, Profibus). It is also possible to control the flow rate using flow on an Unichiller or Unistat equipped with an integrated VPC byрass or external VPC bypass. The flow meters are available in different designs; depending on model and temperature control device. They cover flow rates between 0.2 and 750 liters per minute and working temperatures from -125 to +425 °C. The flow measurement devices can be used to complete basic tasks, such as determining kinetic/dynamic features of reaction syntheses and crystallisation, inspections of heat quantities and scale-up testing. The new E-grade “Explore” allows Unistats (only) to display or request the current system capacity (heating/cooling), as well as of the temperature differences, and is therefore perfectly suited to developing and optimising chemical processes.